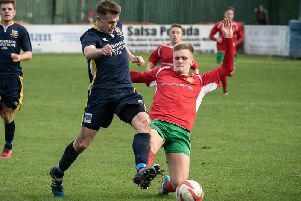 Harrogate Railway boss Craig Ogilvie felt the controversial dismissal of young defender Nuno Pereira cost his side any chance of getting a result at Yorkshire Amateur. The right-back was shown a straight red card for a strong challenge on the stroke of half-time with Saturday’s NCEL Premier Division contest still in the balance. The Railwaymen were 2-1 down at the time having conceded twice early on, but had managed to claw their way back into proceedings courtesy of Sam Barker’s first goal in senior football. “It was a poor decision from the referee. It wasn’t a red card and it proved to be a massive turning point,” Ogilvie reflected. “It was a foul and a yellow card, but nothing more. Even the opposition bench said that. “We had conceded two goals in the first eight minutes and it was a case of sink or swim and credit to our lads, they stuck at it and got themselves back into the game. Matt Dempsey handed the Ammers a fifth-minute lead out of nothing, sending a sweet strike past Jacob Collier and into the top corner of the away net from distance. Things went from bad to worse for the Rail when prolific frontman Ashley Flynn was afforded time and space in the area to pick his spot. The visitors managed to weather the storm and Barker got down the right and crossed for Fraser Lancaster, who couldn’t convert, however the ball found its way back to Barker and he tapped in from close range. The referee’s decision to give Pereira his marching orders for what he deemed a dangerous tackle then left Ogilivie’s men with a mountain to climb after the break and Fernando Moke’s 54th-minute strike wrapped things up for the home team. Next up for Railway is a home clash with Bridlington Town on Saturday, 3pm kick-off.